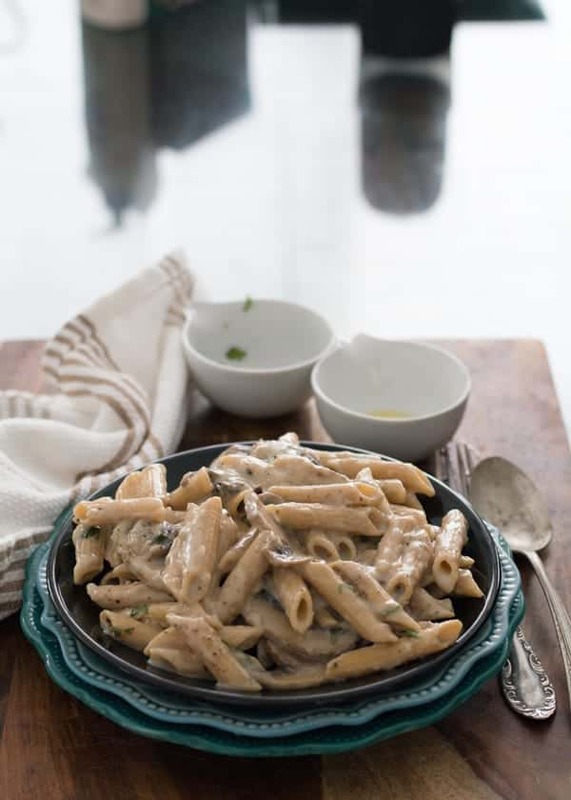 One pot skinny cream of mushroom pasta sauce seasoned with crushed black pepper and cilantro, made in less than 20 minutes. The pasta sauce is delicious and flavorful not only that it can be customized to your individual preference. And not only that it does taste excellent and nutritious. And also with exotic flavor, which made possible with the garlic and the cilantro. For last few years, we started making pasta for dinner a lot, as it is simple to make and gives a full feeling as well. Secondly, it is economical, and thirdly it is a time saver. This cream of mushroom pasta sauce is the skinny version of regular cream of the mushroom recipe. Since I’ve made it for myself, I went through the skinny choice but add Parmesan cheese if you desire. If you are here for a while, you might have noticed that I mostly make skinny versions like these buttermilk pasta and avocado pasta. Having a bowl full of food specially made for you feel your top of the world. Adopting a classic, traditional recipe and customizing to your preference is the most exciting and exciting achievement or goal. You may call it whatever, but for me this customizing part makes me amuse and fascinating towards cooking. Though the recipe seems to look simple with few ingredients, it tastes excellent, and it also perfects for a large crowd also. 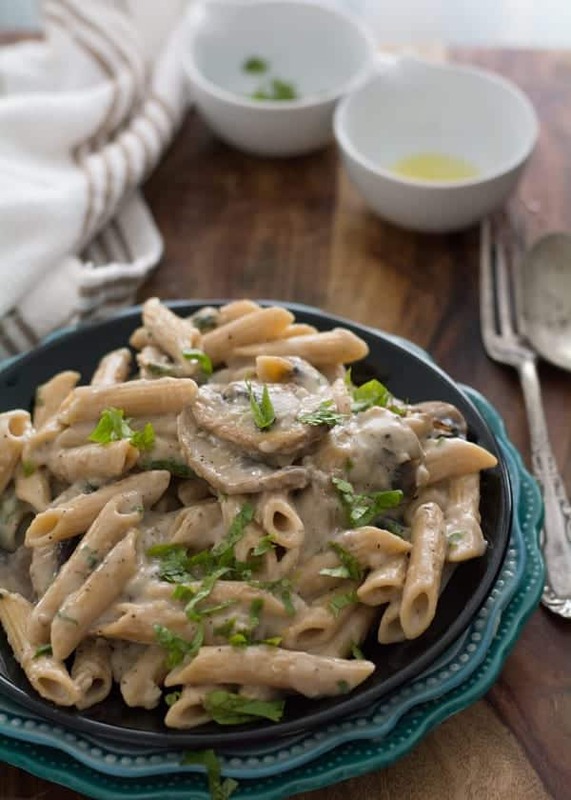 This cream of mushroom pasta sauce has a great creamy texture and taste because of the milk added. You may also substitute regular milk with coconut milk which makes the dish taste entirely different and takes you to the other cuisine. I have added low-fat milk, also made with whole wheat pasta to make it the skinnier and still nutritious. You can make any pasta recipe healthy by the ingredient you choose. 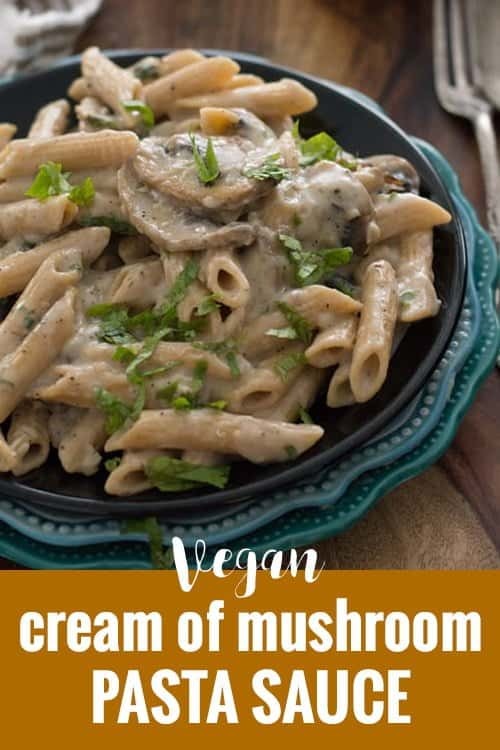 To make this creamy mushroom pasta vegan, substitute milk with almond milk or soy milk or rice milk or cashew milk. Each of these milk has got its taste and flavor, so keep trying out these various choices. If you worry about the two tablespoons of flour added to the recipe, you may substitute cornstarch or tapioca flour, but as I said told you-you earlier the texture of the sauce slightly varies from the all-purpose flour’s creaminess. You can also make the same cream of mushroom pasta sauce for any other pasta varieties like fettuccine, bow, and tie, etc. Step 1. In a pan add two tablespoons of olive oil, sliced mushroom, minced garlic and saute for a while in medium flame. Saute till mushroom leaves out water and get cooked thoroughly. Step 2. Then add two tablespoons of all-purpose flour, saute again till four gets crumbles and changes its color. Now add a cup of milk slowly by adding little at a time. Note: you may substitute all-purpose flour with cornstarch or tapioca starch. And you may replace milk with almond or soy milk. Step 3. When the sauce thickens and turns creamy in texture. Cream of mushroom pasta sauce ready. Add pasta and salt. Cook until the sauce gets coated well with pasta. Step 4. Add pepper and chopped cilantro. Give a gentle stir and serve hot. 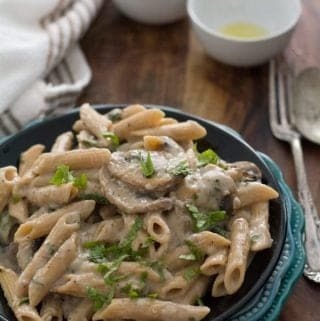 One pot skinny cream of mushroom pasta sauce seasoned with crushed black pepper and cilantro, made in less than 20 minutes. The pasta sauce is very tasty and flavorful. Not only that it can be customized to your individual preference. In a pan add olive oil, sliced mushroom and minced garlic. Saute until mushroom gets cooked well. Saute until flour crumbles and changes it color. Add milk slowly by stirring continously. Add cooked pasta and cook it further for 2 minutes. Add pepper and chopped cilantro. Store the leftovers in refrigerator for upto 3-4 days. When reusing it heat in gently in microwave. If possible, store the sauce and pasta separately, which would be perfect when reheating it. Opt for almond milk or soy milk or rice milk or coconut milk for regular milk. Choose butter instead of olive oil. Choose whole milk or half and half or nonfat milk. You may also add half a cup of light cream and a half a cup of whole milk. Add grated parmesan cheese or mozzarella cheese before serving. It looks good, quick and easy. I can’t wait to try it. Can you give us some guidance on how much milk to use? Glad you liked this skinny version. And Thanks for pointing me out Jim, 1 cup milk is required to make this recipe.